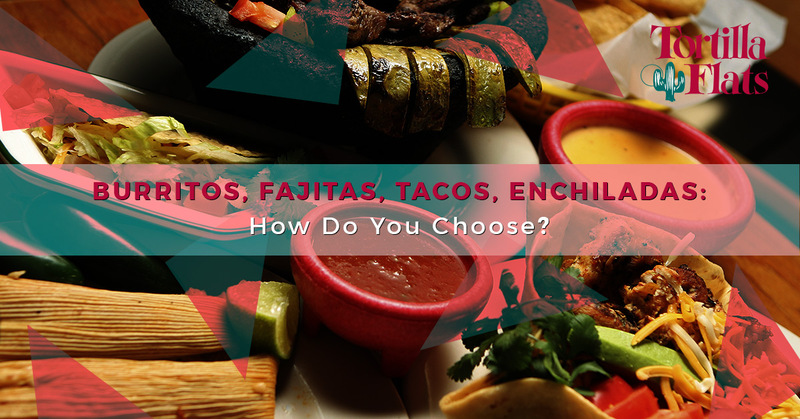 Restaurant in Santa Fe: Burritos, Fajitas, Tacos, Enchiladas: How Do You Choose? Walking into a Mexican restaurant in Santa Fe, you’re undoubtedly met with classic Mexican decor, smells of spicy chile sauce, and sounds of a fajita plate sizzling at a table. You’re brought to a table and handed a menu and you take a minute to quickly glance through the pages to see what’s available and figure out what you have a taste for. The trouble is, everything looks delicious and your mouth is already watering. 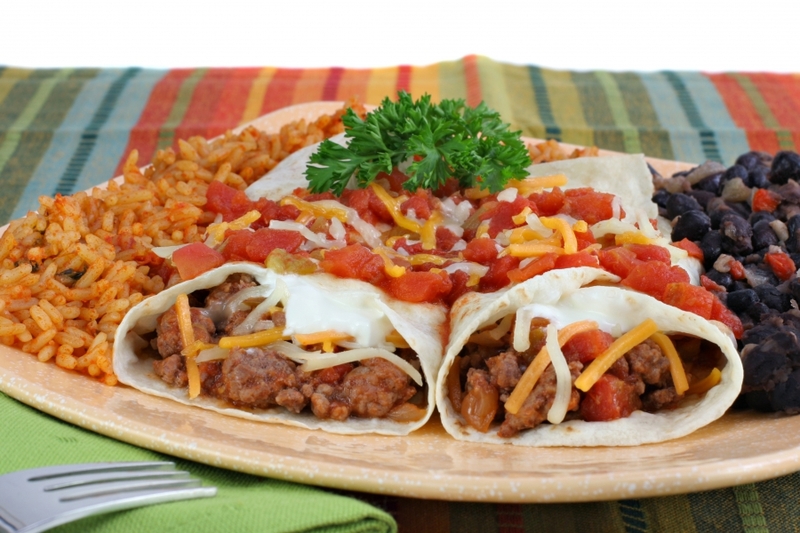 At Tortilla Flats, you can’t go wrong with any of the New Mexican items on our menu. But we’ll go ahead and help you decide anyway. If you choose one of our flour burritos, there are several other decisions that need to be made as well. First, what type of protein would you like? Chicken and potato, roast beef, chorizo and bean, carne adovada and potato? Do you want the burrito smothered in red or green chile? And do you prefer cheddar or jack cheese? No matter what you choose to stuff and top your burrito with, the hot, melty insides will fill your mouth in a delicious combination of soft tortilla, delicious sauce, and creamy cheese. Beef, chicken, or shrimp, this sizzling plate always knows how to make an entrance. If you want to build your dinner and customize each bite the way you want, this entree is for you. Brought to you with sauteed onions and bell peppers, guacamole, salsa, and sour cream, there’s no end to the range of textures and flavors you get with a fajita. The crunchy peppers, creamy guacamole, and crispy onions, topped with cool sour cream, sink your teeth into your favorite protein and watch as the plate contents become smaller and smaller. 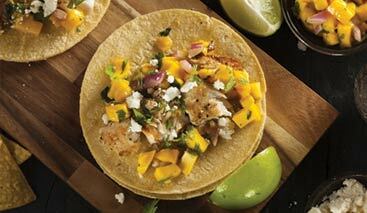 A New Mexican classic, many people go straight to this favorite dish. Tacos, whether they’re chicken, beef, brisket, or fish, are easy to eat and are nonetheless full of hearty New Mexican flavor. Choose between white cheddar and jack cheese to add a creamy texture and finish it off with lettuce and tomato for a fresh and healthy addition. With simple seasonings, the combination of slightly chewy tortilla with perfectly cooked protein is a class you can’t pass up. 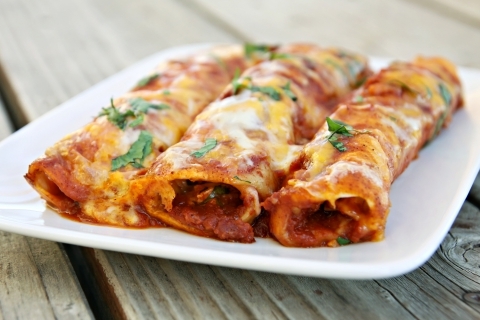 The hot gooey cheese and the tender meat, enchiladas combine everything you love about Mexican food. Your choice between yellow or blue corn tortilla and red or green chile, you can create a meal that does wonders for the soul. Spice it up a bit with green chile, bask in the deep flavor or red chile, or combine the two for a mash-up of amazing spice and flavor. The texture of an enchilada will melt your heart. There are endless options when you come to our New Mexican Restaurant, Tortilla Flats. Crunchy, crispy, chewy, tender, spicy, cool, fresh, you can get it all no matter which dish you choose. And if you can’t decide, ask us which are our favorites and we’ll be happy to provide some opinions. We’ll always be here, so if you want to try them all, come back again, we can’t wait to see you. Don’t settle for just any restaurant in Santa Fe, come a Mexican restaurant with history, flavor, and more.